Submitted by eaparks on Sun, 06/22/2008 - 7:24pm. 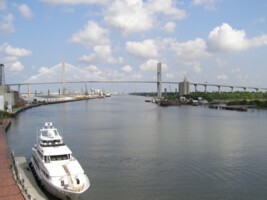 The above picture was taken at Savannah, GA old town waterfront area looking North up the Savannah River. Savannah River ramps, mile markers, and marinas along the Savannah River in Georgia and South Carolina from Augusta, GA to Savannah, GA. Includes ramps and marinas in the Savannah area on the ICW.